Chicken and Bell Peppers Skillet is one of those dishes that will go to your family dinner rotation because it happens to please everyone. 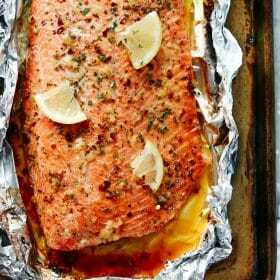 It’s seasoned with lots of spices and it’s also low-carb, paleo and whole30 friendly. This is a delicious chicken dish with lots of flavours that is easy and quick to make and will please you and your family. Why? Have you looked at these crispy chicken thighs? So yummy! The skin is very crispy and the meat is moist and tender. It’s everything we want in a chicken recipe! Also, this chicken and bell peppers skillet is great for the busy weeknight dinnertime since it’s ready in less than 30 minutes. 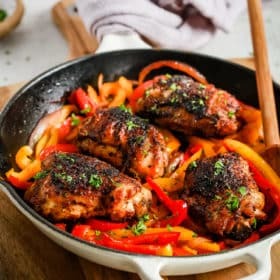 I think it’s even better than the unhealthy classic fried chicken and this chicken and bell peppers dish just happen to be whole30, paleo and low-carb. 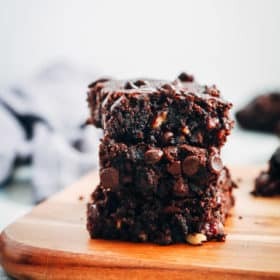 Wow healthy, but yet DELICIOUS! 1. All starts with you heating a large skillet over medium-high heat. It needs to be very hot before you pour olive oil and chicken. This step is important to give the chicken skin the brown looking you’re looking for. 2. Then, place chicken in a bowl and season with all your favourite spices. You can’t go wrong here. Add all the spices you prefer. I love using paprika, garlic powder, salt and black pepper. 3. Pour olive oil to skillet and then add chicken in the skillet, skin side down, and cook 4-6 minutes or until browned. The time will depend on how hot your skillet is. Turn chicken over and cook for 1 minute. Set aside. At this point, your chicken won’t be completely cooked. 4. 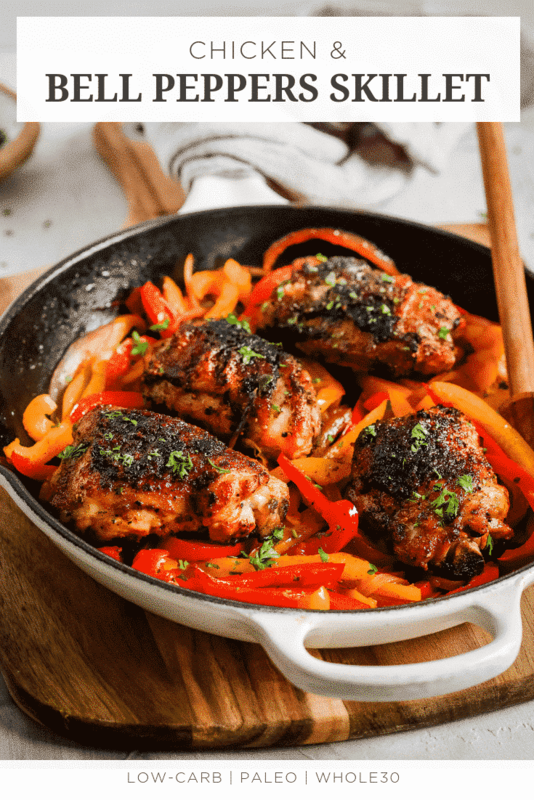 Remove skillet from the heat, place in your countertop and add all the ingredients for the peppers (red bell pepper, yellow or green bell pepper) and onion in the same skillet you cooked chicken. Stir everything well to combine and bring chicken back to skillet on top of the peppers and onions. 5. Place the skillet in the pre-heat over and bake at 400°F for 15-25 minutes or until chicken gets the internal temperature of 165ºF. What serve with chicken and bell peppers? · Or even it on its own. It’s delicious anyway. · Chicken Fajita Meal Prep Bowls from Primavera Kitchen. 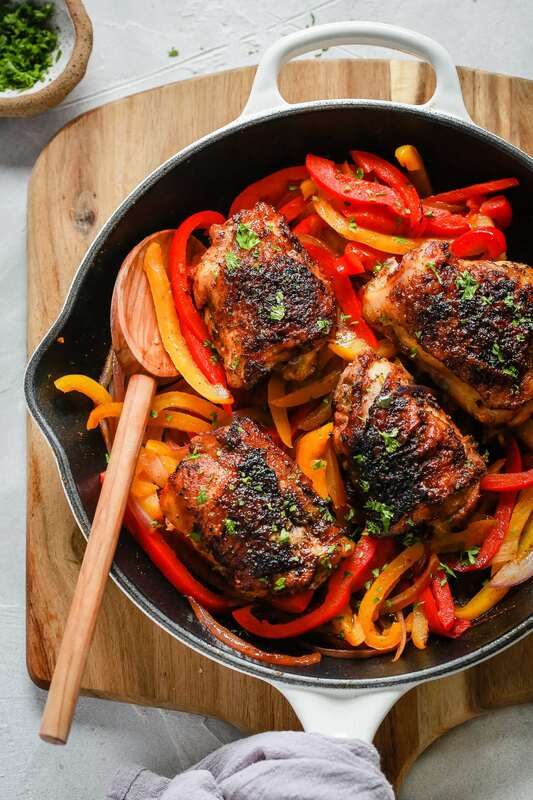 · One-Pan Mediterranean Roast Chicken from Primavera Kitchen. 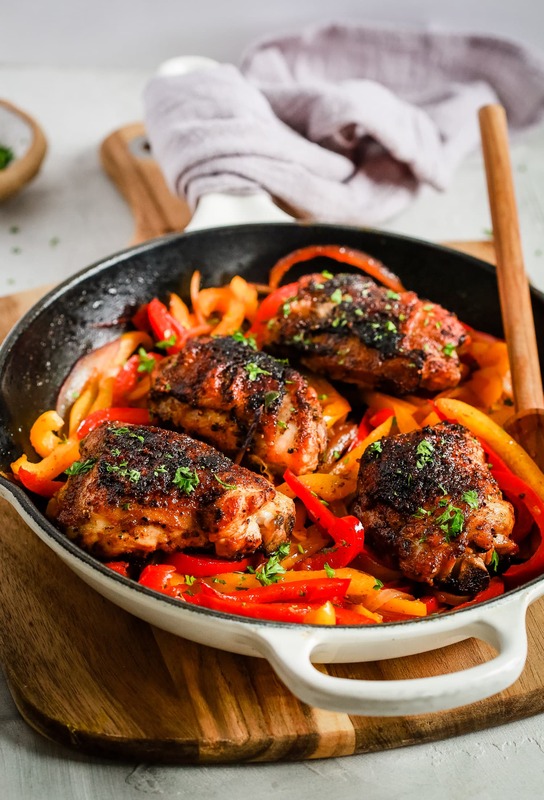 · Baked Chicken and peppers from I Food Real. · Easy Pepper Chicken Stir Fry from Spend with Pennies. Heat a cast iron skillet over medium-high heat in the stove. Meanwhile, in a large bowl place chicken and all the seasonings for the chicken. Mix everything well to combine. Add olive oil to skillet. Add chicken in skillet, skin side down, and cook 4-6 minutes or until browned. Turn chicken over and cook for 1 minute. Set aside (chicken won’t be totally cooked yet). Remove skillet from the heat and add peppers, onion, garlic, paprika, red chili flakes and salt and peppers. Stir everything well to combine. Arrange chicken on top of the peppers and onions and place the skillet in the pre-heat over. Bake at 400°F for 15-20 minutes or until chicken gets the internal temperature of 165ºF. Enjoy!